"Human workers will always be an important part of the production of aircraft. The workers have been omitted in this animation to help provide a better view of the advanced tools that may be used in future factories." That awkward, if not creepy, disclaimer is from a short 3-D film about how modern jetliners are built, which you can see for yourself at Boeing's Future of Flight Center near Everett, Wash., about a half-hour north of Seattle. But even a clunky reminder about the importance of humans is helpful when trying to convey the inhuman scale of the aircraft company's nearby assembly plant for large commercial planes. The voluminous plant, which I toured this week, will be an awe-inspiring find for some future archaeologists -- a 20th Century temple designed to serve as a hatchery for huge flying machines. 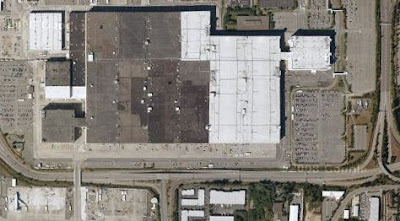 One way to appreciate the size of this operation is to compare the building in the picture above (snagged from Google Maps) to the tiny aircraft in the bottom left corner of the image. That plane, enlarged here, is actually a mammoth "Dreamlifter," a cargo-carrier derived from an old 747-400 to haul large components for Boeing's new energy-efficient 787 "Dreamliners." The cargo plane's wingspan is 211 feet. A tour guide told my group that the 12-story, 98-acre building was large enough to hold Disneyland. But my colleague Bill Adair, who visited the plant when he covered transportation for the St. Petersburg Times, really put the facility into perspective when he called it "one of those stunning human achievements." "It's one thing to see a 747 or a 777 at an airport," Bill wrote in an e-mail after I told him about my tour, "but it's even more amazing when you see a dozen of them being assembled in the same place." Boeing first built the plant in the 1960s to assemble 747s, now the granddaddy of jumbo jets, which celebrates its 40th anniversary next year. More than 1,400 of been made here and orders for new ones are stacked up for years to come. Two expansions created room to also nest Boeing's 767s, 777s and much-delayed 787s. The first 787 is nearing completion, with several more lined up behind it inside an assembly bay at the east end of the building. Unveiled publicly at a ceremony last July, it is now encircled by busy engineers. 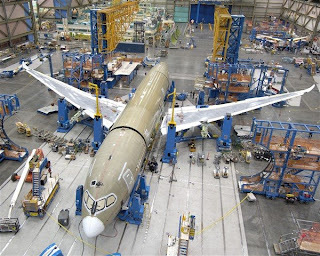 And as Aviation Week's Michael Mecham and Guy Norris recently reported, the final assembly line "still looks like a hospital emergency ward." If the 787 goes into service as currently planned next year, it will be Boeing's first new airliner since 1995. Tourists are not allowed to carry cameras inside the building, as an armed guard reminded my group after we boarded a bus for the short ride to the plant. 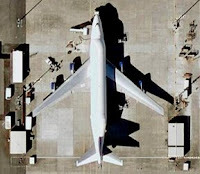 But this Boeing image from the 787 production line (left) gives you a sense of what the place looks like. After the Boeing visit, my aviation tour of the Pacific Northwest continued at the Museum of Flight, just off I-5 near the Seattle-Tacoma airport. The first 747, a 1969 prototype, is on display there, next to a retired supersonic British Airways Concorde that visitors can walk through. Supersonic jetliners have been a personal fascination since 1976, when my third-grade class at Dogwood Elementary in Reston, Va., stood in an athletic field behind the school one day to watch a Concorde fly overhead on the way to its first U.S. landing at nearby Dulles airport. My January CQ column was about the next generation of high-speed passenger planes, which are likely to be relatively small, faster-than-sound business jets rather than large-scale airliners like the Concorde. Speaking of fast planes, a future aviation tourism stop will be the Hiller museum in San Carlos, Calif. Its holdings include a portion of a full-scale mockup of a Boeing B2707-200, a federally subsidized program to build a U.S.-made supersonic passenger jet (also known as a supersonic transport, or SST). Congress canceled that program 37 years ago. And speaking of big aircraft and the bigger buildings needed to house them, an additional stop planned for my current trip out west is the Evergreen Aviation and Space Museum in McMinnville, Ore., home of the Hughes HK-1, better known as Spruce Goose, one of the largest airplane ever made. We also have planned a seaplane tour of the Seattle area. Flying on Virgin America is probably as close as I'll ever come to a ride on the Pan American airline space shuttle from the 1968 movie "2001: A Space Odyssey" (interior screen shot above). My plane might not be waltzing to Strauss with an orbiting space station and my pen might not float out of my pocket, but this is a nice way to travel. The Virgin America crew looks and dresses like the hip young staff at a W hotel. The sleek black and white seats and purplish mood lighting makes it feel like we're flying inside a giant winged MacBook. And the Airbus A319 is so emaculate that I feel guilty brushing crumbs on to the floor. There's even trendy "Method" soap in the lavatories. "participants in this chat: 1"
Many of the other features offered through "Red," the name of Virgin's in-flight "multimedia environment," would be familiar to passengers who are accustomed to flying first class or business class on transcontinental or international flights (games, music and on-demand movies on a personal monitor). And while in many ways it also is quite a bit like the JetBlue in-flight entertainment system -- albeit with a snazzier, more interactive interface -- Red is still plenty nifty for those of us who spend more time riding in the cheap seats on no-frills carriers such as Southwest. In addition to Red's nine-inch touch-screen, a removable remote control is built into each arm rest. The remote is elegant and easy to use, especially given the range of controls. One side of the remote has a game controller and a full QWERTY keyboard. The other side has TV controls (volume, a channel changer) plus other options. Press the button with the cheesecake icon (or is that a slice of pie?) and you get the "Eat" menu, from which you can order meals or snacks, such as the $6.99 Yogurt Parfait I had for breakfast. Payment is made with a credit card using the reader under the screen. There's also a credit card reader built into the remote. If only all user interfaces were this intuitive. The food-ordering system also appears to include a smart inventory-management function. The Yogurt, for instance, seems to be sold out now and no longer appears on the menu. We're sorry but this feature is not yet available. Please check again the next time you fly." The same message pops up for the "Read" and "Shop" options on the Main Menu bar, which runs across the bottom of the screen. Internet-based e-mail and text messaging also are coming soon. One of the most intriguing things about the remote is the built-in speaker and microphone, arranged as if on a phone. Are the old air phones making a comeback in new form? Great. Now there really will be no escaping that chatty cell phone user on the subway. I have mixed feelings about all of this in-flight interactivity. Long flights have become one of the few remaining havens from online communication. Perhaps other passengers on this flight feel the same way, which might explain the mostly vacant chat room screen I'm still staring at. Yes, I can create my own haven by simply turning off my Blackberry, laptop and mobile phone -- and probably should do so much more often than I do. But it still has been nice having some temporary midair communications blackouts imposed by on high -- so to speak. But with Red and systems like it on other airlines, telecommuting will soon reach new heights. Also worth mentioning: Every Virgin America seat has its own 110v power jack. So even laptop battery life will no longer be a credible excuse for a little time off the grid sometime in the very near future. My new "Save the Girth" diet plan is based on "carbo trading." You buy credits from someone who eats less than you to offset your own consumption, which can then continue at a comfortable pace. The Earth pictured here is made out of ice cream -- the concept of which made me think about the Washington Post's current multimedia series on childhood obesity. One study cited by the Post found that even a modest increase in future adolescent obesity could lead to more than 100,000 additional cases of coronary heart disease in the United States by 2035. An accompanying four-decade time line links increasing obesity in part to "devices that encourage people to sit inactive for long periods" -- from the arrival of the Apple II computer and the first VCR in 1977 to release of the Nintendo Game Boy in 1999. As usual, technological problems produce technological solutions: an electronic "TV Allowance" device. And science even validates its efficacy. The Wall Street Journal's Health Blog looked at a recent study of 4- to 7-year olds who spent at least 14 hours a week watching TV or playing computer games. The study found that the TV Allowance gizmo was an effective tool for reducing the body mass index of budding couch spuds. No surprise there. What was a bit surprising was that the findings seemed to have less to do with the kids getting off their cans and running around than it did with changes in what the study group consumed. As the researcher put it, "Reducing television viewing and computer use may have an important role in preventing obesity and in lowering BMI in young children, and these changes may be related more to changes in energy intake than to changes in physical activity." As I type all this, I can hear my wife plotting to limit my laptop access with a TV Allowance device. But my preference would be to hook the computer up to a generator driven by an exercise bike instead. Fortunately for me, MIT is already on the case. Philadelphia got plenty of attention when former Mayor John F. Street launched his city's ambitious efforts to provide low-cost wireless Internet access to its citizens. Governing even recognized Philadelphia's former chief information officer, Dianah L. Neff, for her leadership in the area as one of our Public Officials of the Year in 2006. By the following year, however, the city's ambitious Wi-Fi plans were looking pretty iffy -- as were similar efforts in communities across the country. Philadelphia's corporate partner, Earthlink, decided to abandon the municipal wireless business last fall. And on Tuesday the Atlanta-based company announced that it would begin shutting down Philadelphia's network on June 12. Earthlink said it had been in unsuccessful talks with Philadelphia officials and an unnamed non-profit for months to arrange a free handoff of its $17 million network, which already blankets more than 75 percent of the city. The non-profit in question is presumably Earthlink's current partner, Wireless Philadelphia, whose chief executive, Greg Goldman, said that his organization was working with the city "to identify alternatives for preserving this network and applying it to numerous civic, commercial and social purposes." "The transfer of the EarthLink network is by definition a complex, time-intensive, multi-party transaction," Goldman said. "...We remain optimistic for an orderly resolution of this matter." Meanwhile, Earthlink is already heading to federal court to try to cap its liability and guarantee its right to start taking down its equipment. In retrospect, Glenn Fleishman of Wi-Fi Net News says the big wireless networks envisioned by leaders in Philadelphia and many other cities faced daunting challenges from the start, including higher-than-anticipated operating costs, decreasing rates for competing commercial broadband services, and technical difficulties delivering Wi-Fi through walls. "The failure in Philadelphia, and EarthLink's exiting the entire muni-Fi business, represents the end of a bad model in which a company agreed to assume all risk and costs associated with building a public access network," Fleishman wrote shortly after Wednesday's announcement. "When the assumptions were that networks would be cheaper and easier to build in 2005, and that citizens in many larger cities had few affordable broadband options, it made some sense to build a network on spec." Municipal wireless networks still offer opportunities to local governments, especially for helping manage and monitor services. Governing's Chris Swope wrote last year about how officials in Corpus Christi, Texas, are making that model work. Another former Earthlink partner, Houston, has similar plans -- and also aims to provide bubbles of public Internet access via its wireless network in key areas. Other wireless technologies may turn out to be key components in filling gaps in the public broadband coverage currently provided primarily by cable and phone companies. Last week, Sprint Nextel rounded up an unusual group of partners (including Comcast, Intel, Time Warner Cable and Google) to join it in investing $3.2 billion in a venture called Clearwire, which aims to quickly build a national high-speed wireless Internet network using an emerging standard called WiMax. An earlier Sprint-Clearwire deal to build a national WiMax service fell apart last November. So how does WiMax work? Unlike short-range Wi-Fi networks, which function well in homes, offices and coffee shops, WiMax works over distances measured in miles. That's a plus. But making WiMax widely available would depend on building a wide-ranging network of cell phone-like towers. It also would require computer makers and customers to take to the new technology, which is relatively untested. "WiMax certainly holds promise, but as far as consumer wireless applications are concerned, we will not fully see what it can do until at least 2009," Alan Shark of the Public Technology Institute told me in an interview last September. Of course, Clearwire's WiMax plan is a private venture. Does government have any role to play in directly providing broadband access to citizens, as Mayor Street set out to do in Philadelphia? In the end, no one technology or provider is likely to dominate how Americans access the Internet -- just as the United States still depends on a range of energy providers and energy sources to keep the lights on. As it has been with electricity, government may indeed be a better service provider than the private sector in certain communities -- perhaps even the only service provider. But even when government is not a provider, it still can assemble leaders from all levels of the public sector and all sides of the telecom industry to try to chart a common course. Otherwise, today's hodgepodge of U.S. Internet services will never become the seamless network of connectivity that many citizens/customers are looking for. See my January Governing column -- "Beyond Wi-Fi" -- and my Managing Technology newsletter from September for more thoughts and observations on this subject. An international space crew's close call with disaster reentering the atmosphere in this Russian space capsule two weeks ago could complicate NASA's long-term plans. Here's the issue: When the U.S. space shuttle fleet goes into retirement around 2010, the agency will be dependent on its Russian partners to provide access to the International Space Station -- just as NASA was when the shuttles were grounded for more than two and a half years after the 2003 Columbia accident. Since the next generation of U.S. spacecraft capable of ferrying crews to and from orbit won't begin flying until at least 2015, any questions about the reliability of Russia's hardware could threaten plans for keeping the space station staffed and operational. These implications are getting a new round of press coverage and discussion now that U.S. Astronaut Peggy Whitson is publicly describing the frightening details of her April 19 return to Earth -- even if she is delivering those details with all of the casual cool of a "Right Stuff"-era space pioneer. A dangling propulsion module appears to have sent the Soyuz TMA-11 capsule into the intense heat of atmospheric reentry facing in the wrong direction. The capsule righted itself after the module belatedly separated. But the crew then had to endure a gravitationally difficult ballistic descent ("I could feel my face being pulled back and it was pretty hard to breathe," Whitson said). 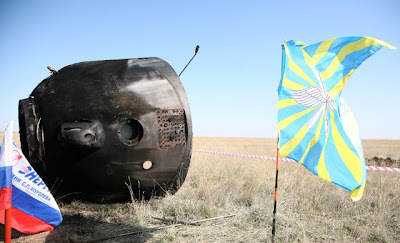 Mysterious smoke wafted through the cabin before the capsule finally landed nearly 300 miles off course. Baffled local Kazakhs made it to the crew before a Russian rescue team. An investigation by Russian space authorities will determine the extent of the danger to the crew, which also included Cosmonaut Yuri Malenchenko and South Korean engineer So-Yeon Yi. Asked if her bumpy ride home raised any concerns about the dependence on the Russian vehicle, Whitson said the Soyuz "is a very reliable spacecraft" and expressed confidence in the Russian investigation. "But I also think, personally, that we want to minimize the gap between the time when we have to rely solely on any one vehicle. I think after Columbia, it was very important for us to have the Soyuz capability. 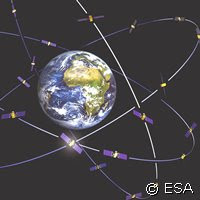 I think we always need to be prepared to have more than one option to getting into space." As a backup to the Russians, some have suggested that NASA team up with China, whose third human space mission is tentatively scheduled to lift off this fall. However, China's human-rated Shenzhou spacecraft is still new and relatively untested compared to the decades of flights logged by the Russian Soyuz. And China's military ambitions in space are a big worry in Washington, too. I looked at the state of the Chinese space program in my Feb. 3 column in CQ Weekly and at U.S. concerns about China's military space activities in an earlier article. And a Chronicle graphic (PDF) illustrates what is known about the April 19 reentry. "If you can't describe your project in a Tweet, try harder." -- Gary Kebbel, program officer for the John S. and James L. Knight Foundation, in a May 3 Twitter post, updating one of writing's most important rules: "Omit needless words." Let's leap to May 2014: The much-anticipated finale of "Found," a popular program from Microsoft's Disney division, is going to be a mega-hit. But what being a hit means may not be good news for the program's sponsor, Swallow Throat Spray. Writing on his advertising/media blog, On Demand, Rob Norman, the present-day head of GroupM Interaction Worldwide, described how he thinks the viewing audience of six years from now might actually watch a show like "Found." Then he crunched the imaginary viewership data and discussed its implications for media planners looking ahead to 2015. In Norman's scenario, the program premiered on 300 IMAX screens, where it was seen by an aggregate attending audience of 400,000. Users also downloaded 20 million copies. The 6 million sold at $10 a pop had to be viewed within 72 hours while the rest, sold for $20, came with extra features and could be viewed indefinitely. Seven million also paid $5 for a subsequent pay-per-view edition with limited commercials -- and a third of those were viewers used mobile devices. Six weeks after the IMAX premier, a "free to air" version attracted another 23 million viewers. Significantly, from the point of view of the program's sponsor, "less than half of all the full length showings were ad supported and... less than 20% of total content revenues were believed to be generated by advertising," Norman wrote. For a 2015 advertiser such as Swallow Throat Spray, that means that "reach," still a key advertising metric back in 2008, would be "an unaffordable objective and has for all practical purposes ceased to be a relevant measure." "The overarching trend has been clear for sometime: Media strategy has evolved from the placement of messages to the distribution of content. Consumers control the content they consume in terms of time, place and device." At least that's how things look in Norman's 2015. Hard not to wonder if the media landscape he envisions is as far out, or even as far off, as seven years from now.